The Miami Heat brand is stale. Their logo style has been around since the eighties and their uni style has been around since the nineties. That's acceptable if you're a team like the Chicago Bulls, who have had the same beloved, iconic logo since their inception in the 1960's. 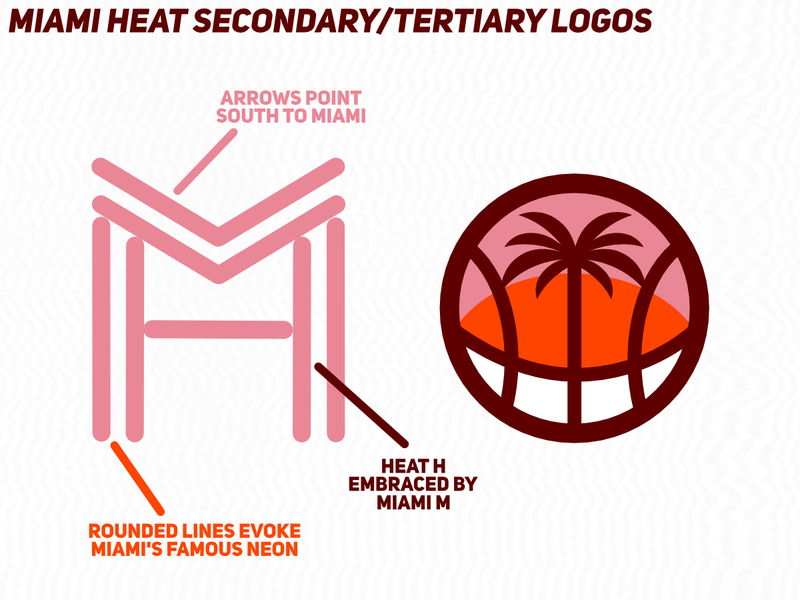 Miami's Flaming-ball-through-basket logo has become almost iconic in it's own right, but most logos that have hung around as long as the Heat's become well-respected, regardless of imperfections. The Heat fans seem desperate for a change and have embraced the team's alternate Vice identity as strongly as America embraced Crockett and Tubbs in 1984. That's great and all, but a 30+ year old fanbase deserves a fresh, relevant basketball identity so that's what I sought to accomplish with this rebrand. Odes to Miami Days, Dusks, and Nights are included throughout as the main logo becomes sleeker, more abstract, and with more purpose. The colors are more current, bright pink and orange in, yellow out. 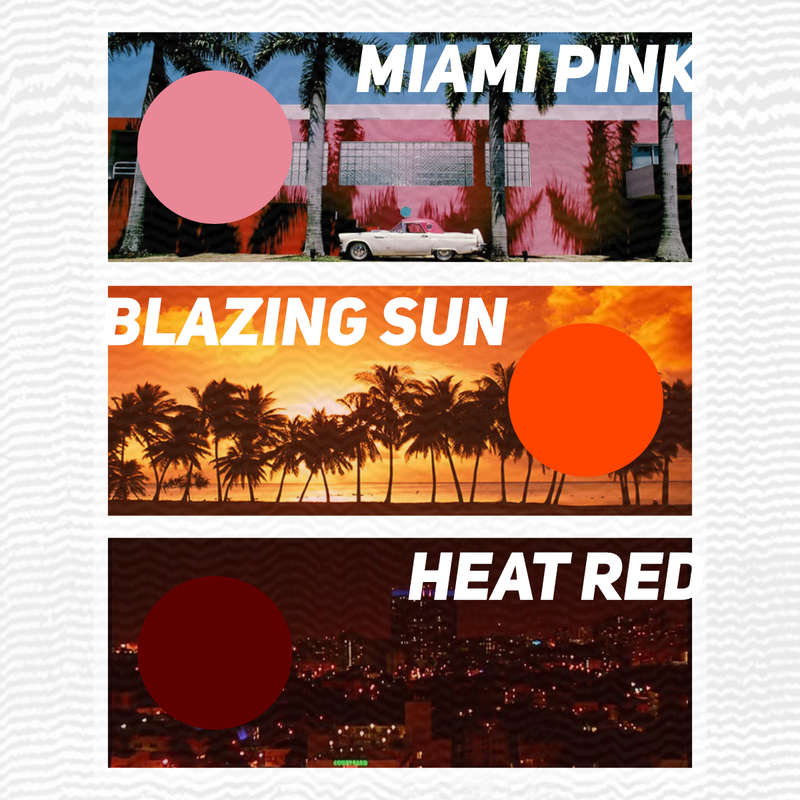 There's also, I hope, a feeling of versatility in the different brand assets from the uniquely Miami neon set piece to a more hipster element seen in the repeating word mark and color ID. Cause the NBA. The static backgrounds are a small vaporware touch and the Billboard hangs on to a little bit of the Miami Vice alt. identity, which in this universe sticks around as a City 4th jersey. I am a huge fan of this, but if you are going to go pink, especially with such a washed out red, go PINK! The jerseys have a bit of a 70's vibe but they would also hold their own on a current NBA court as well. Thank you, man! Yeah, I definitely could've been more aggressive with the pink, although seeing how often teams wear their statement jerseys, fans would probably see a lot of it. Stand by it as an accent, but I'm a fan of bold color schemes as well so i for sure don't disagree w/ you. Was actually going for a vaporware sunset deal, but I'll take it! I agree while the logo is fantastic, the maroon and orange don’t work for me with pink, I think it’s the dark and bright being the same hue. I really, really like the primary and tertiary logo designs -- one is a perfect modernization of their flaming basketball logo, the other is a much-needed inclusion of palm tree imagery. 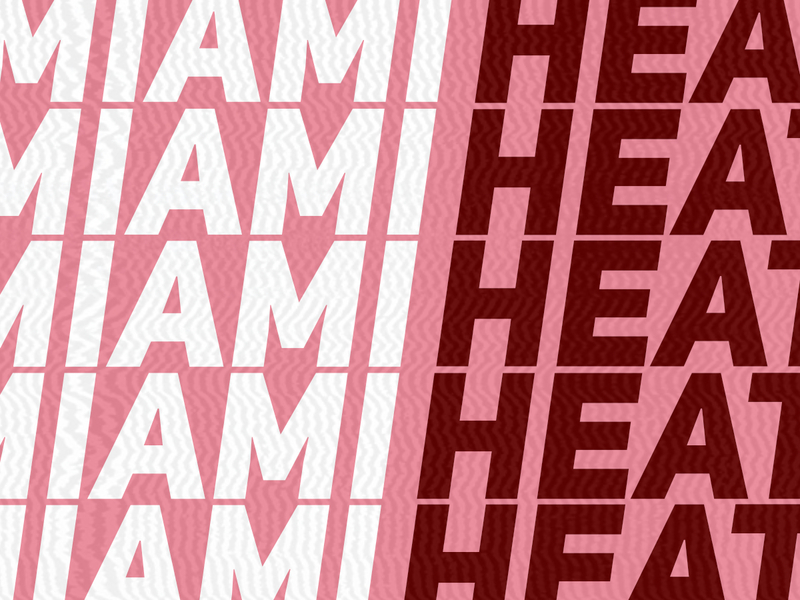 The 'MIAMI' script is outstanding; the 'HEAT' script feels a bit out of place relative to the rest of the concept considering how thick and block-y it is. As others have mentioned, the color palette feels a bit off. I appreciate the reasoning behind each color selection, but I feel something a bit more cohesive - their current palette, the Vice palette, etc. - would take this to the next level. 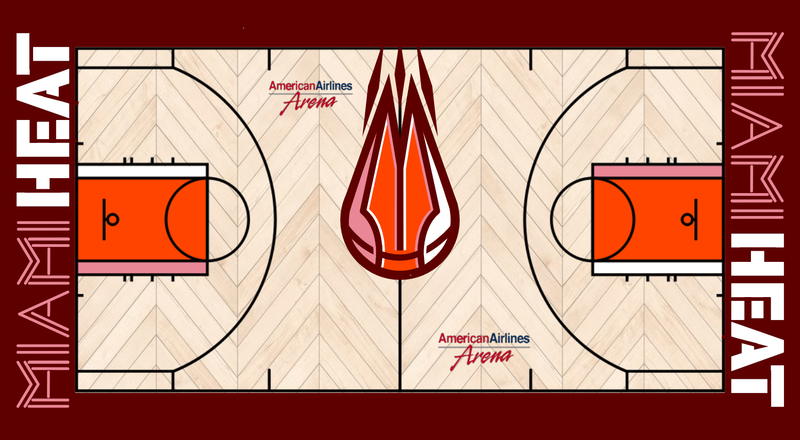 I'm also a big fan of the court -- the oversized primary logo at center court gives a nice retro-y vibe, the palm tree pattern is perfectly subtle, and the asymmetrical key coloring is a fun touch. The jerseys are fine, though I'm skeptical as to how they could fit into a cohesive uniform. I suppose it depends entirely on how the horizontal striping pattern transitions into the shorts design. Overall, this is an outstanding and unique concept with tremendous presentation! Thank you! Well, that seems to be the consensus. Not to sound stubborn, but I do still personally like the scheme and the overall absence of black. I did try some other options though, including a Vice which I still don't think is strong enough to be a main identity, but like I said I would keep around as an Alternate. Also tried it w/ their current colors, but don't really think that works that well. Are there any you like better here, or any options I didn't include? This is honestly some of the best and most thoughtful critiquing I've ever gotten, thank you very much! I was torn for a second on whether to have the Tertiary be the Primary and vice versa, but I had to include both and the flaming ball didn't make much sense as an alternate. Great to hear! Thx again! I tend to agree w/ that even more than the colors being off, the blockiness could for sure be toned down. 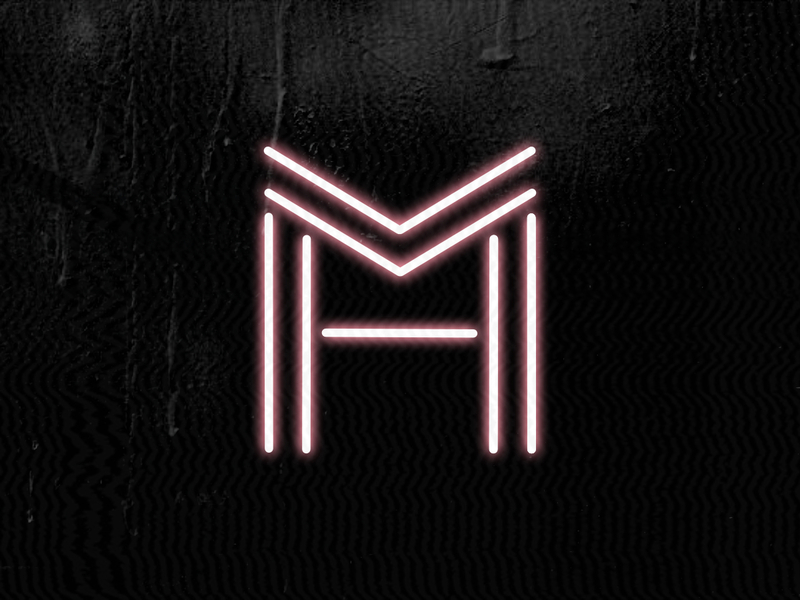 Didn't even intend for that pattern to be reminiscent of a palm tree, was really just going for the top of the M shape! Key's my fave part. It would probably just reverse and white stripes would get thinner as they went down. Thank you so much for this incredible feedback! Love to hear what you think of the edited options above. Fantastic concept. I'm actually staying in Miami right now and the logos (especially the secondary) perfectly represent the area. I echo @Hoopladawg87 about the colours. The reasoning behind each one makes sense, but they need to work as a unit. The triple-shade of red move was bold, but it needs something else in there. 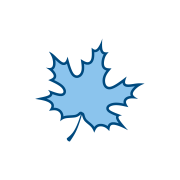 My suggestion would be sky blue-orange-maroon, and just swap out pink for the blue. 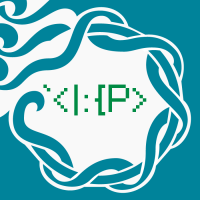 One additional thought about the wordmarks, I'd try out two different sets. One will the block-style and one with the neon-style. Maybe the block style is the official (which is also similar to the one they have now) and the neon would be used for the throwback nights. Overall, it's a great set and I appreciate the way it's presented. Nice work. Absolutely love everything except the jerseys. I think those would not age well as others have said. Everything else is great though. Really like the slogan and the basketball logo. Of course it’s up to you to decide what you like best because it’s your concept, but I wouldn’t mind the 1st 3rd or 4th one. The last one reminds me of the cavaliers a bit too much. However, the 2nd one I think would be a winner if you used the brighter pink. 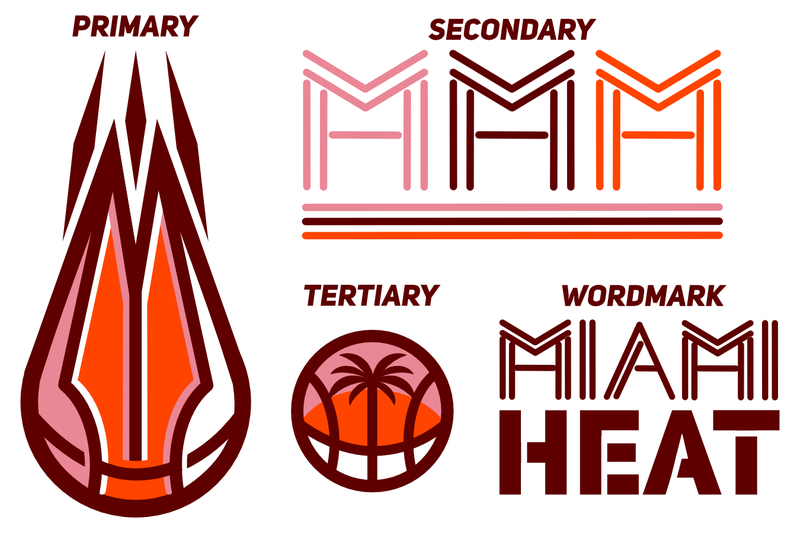 I really like the palm tree logo and the Miami wordmark! They seem very fitting for the city. They really elevate the concept. 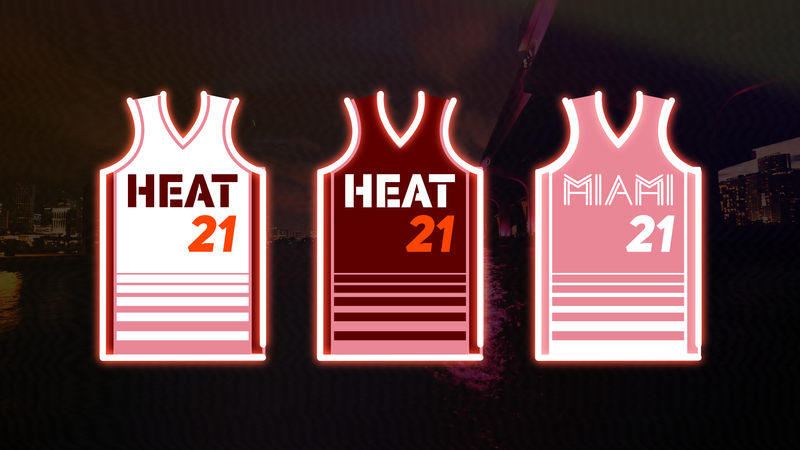 I think a Heat wordmark to match the Miami would be really cool. I'm not a huge fan of that primary; like @EasleyK , I also see a pen. 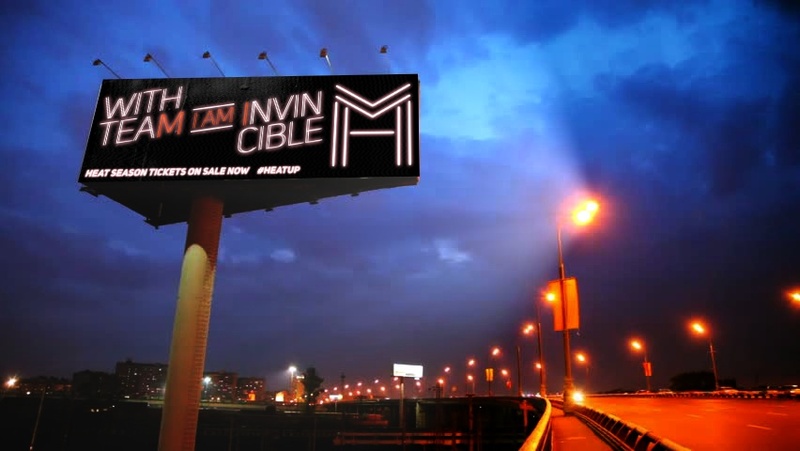 Finally, you've got a good slogan; I just think it would sound better as "With *my* team I am invincible." I disagree with the sentiment that the Vice theme couldn't serve as the Heat's full-time identity, but I also don't believe it to be the be-all, end-all for them either. I'm also intrigued by the idea of eliminating black from whatever color palette you choose. Perhaps a combination of their '90s and current palettes with or without black - red, orange, yellow - could work? 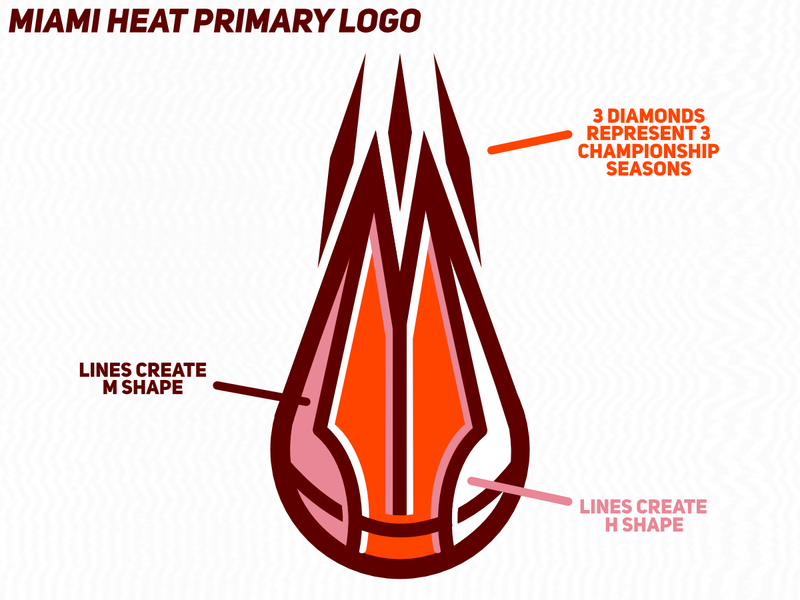 It would remain consistent with their color history, create a palette unique to the NBA, and utilize warm tones to embody the concept of heat. As for the options above, I'm really not sure I love any individual one of them. The right side of the basketball being white feels a bit off-balance vs. the left side being bright pink, light pink, or yellow. Perhaps re-balancing the colors would help, though I'm not exactly sure I have any good suggestions at the moment. Also, I'm a big fan of @vtgco's suggestion to convert the jersey striping to sublimation -- I think that helps retain the effect without complicating the transition from jersey to shorts.